Frame Productions is proud to announce the broadcast of its TV series ‘Pubs of Ireland' on Sky 389 on 24th February at 7:30pm and run for 10 weeks. The conversation, the music, the roaring turf fires... there's beauty in an Irish pub. And you'll find one in every town and village in Ireland. 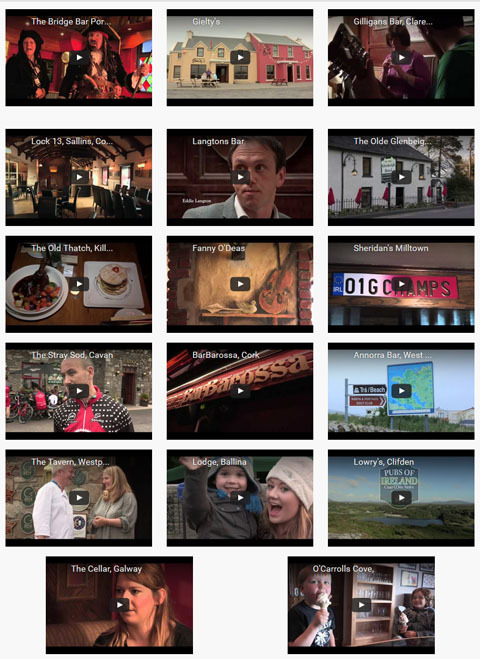 Watch Pubs of Ireland and explore the stories and people that make pubs in Ireland the envy of the world. Featuring 27 of Ireland's finest bars, the viewer gets the opportunity to meet the characters and hear stories that are the bedrock of the Irish pub community. Filmed in the summer by Frame Productions, the series of 10 shows sets out to capture the unique atmosphere of 'the local' and share the stories of publicans and customers. Show Producer Kevin Griffiths said "It has been a real pleasure to meet and talk to so many people with great stories to tell. We really hope that this programme will go someway towards helping promote the local pub as one of the centres of the Irish Community." With plans to also broadcast in the USA in the coming months the series Director Niamh Morley said "Being able to capture the heart of the Irish pub and its patrons has been a wonderful experience. There is a great history attached to many of the pubs we filmed and even the more modern establishment has character and warmth." A full list of pubs can be found at http://www.pubsofireland.ie along with previews of the pubs appearing in the show.